There is a central clubhouse within the greenery enclave in Ampang 971 that houses a swimming pool, squash courts, aerobic room and a gymnasium. There are numerous amenities near the townhouse. Just located a stone throw away from Ampang 971 is Gleaneagles Hosplital. 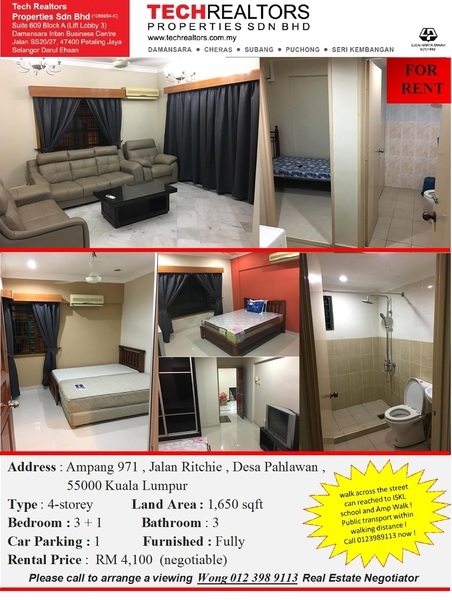 Also, Ampang 971 is within short walking distance to Great Eastern Mall that houses Cold Storage together with a bunch of branded apparel stores, saloon and fancy restaurants as well as bars. Moreover, Ampang 971 is just located about 3 kilometers away from KLCC and the city centre. It is situated hundred meters away from the Royal Selangor Golf Club and The Raintree Club. It is also within short driving distance to a number of embassies including High Commission of The Federal Republic of Nigeria, Embassy of The State of Qatar, Embassy of Republic Yemen, Embassy of the Republic of The Sudan and Lebanon Embassy to name a few. 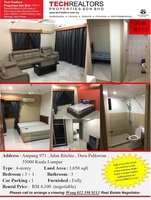 Unit open fo rent now ! Call 0123989113(WhatsApp) now !